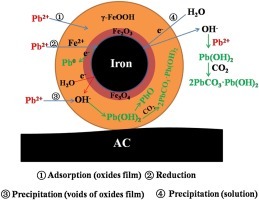 Activated carbon supported nanoscale zero-valent iron composite (NZVI/AC) at ultralow iron content was synthesized and used to remove Pb(II) from aqueous solution. The technical characterization revealed that the loaded amorphous NZVI nanoparticles had a chain-like shape in or close to pores and were found as individual nanospheres with size of approximately 10 nm on the outer surface. The NZVI/AC with the iron content of only 1.57% showed a highly efficient Pb(II) removal performance with 95% of Pb(II) eliminated within 5 min. The adsorption capacity of Pb(II) by NZVI/AC was 59.35 mg g-1 at 298.15 K with a pH of 6.00, which was 8.2 times than that of AC support only. The monitoring of iron release indicated no iron was released at a pH above 4.02. The Pb(II) removal by NZVI/AC was well-represented by a pseudo-second-order kinetics model and showed the behavior of an exothermic process. Essentially, Pb(II) was converted to insoluble forms such as Pb°, PbCO3, Pb(OH)2, PbO or white lead ([2PbCO3·Pb(OH)2]). These reactions were accompanied by the surface oxides aging of NZVI/AC. To summarize, these results represent the first fabrication of NZVI/AC composites with such low iron loading that still present an outstanding Pb(II) removal performance in drinking water purification. Key words:Nanoscale zero-valent iron; Activated carbon support; Pb(II) removal; Kinetics; Drinking water.